Monitor Audio Vector VW-8 review | What Hi-Fi? 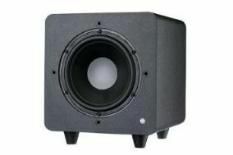 Part of Monitor Audio's Vector range of style speakers, the VW-8 would normally be used as part of a surround set-up, but you can also buy components individually. The VW-8's cabinet is an MDF construction and comes in textured black or textured white. The driver used is a 20cm, long-throw design, which uses Monitor Audio's rigid MMP II (Metal Matrix Polymer) cone design. There's a bass reflex port on the underside of the cabinet and amplification weights in at a relatively modest 100W. Features and connectivity options are limited, as you'd expect at this level. Volume and crossover controls are on the rear panel, as are switches for altering phase and bypassing the internal crossover. Given the VW-8's compact size, it can't plummet as low as rivals, but bass quality is good for a sub of this ilk. Spin Eminem's Without Me and it matches the bassline beat-for-beat, while throwing up a fine level of detail. The VW-8 exhibits good control and doesn't lose composure when pushed hard. However, leading edges of bass notes sound soft and lack a little definition. Top rivals offer a touch more agility, too. Nevertheless, for the money, the VW-8 is a capable little subwoofer and will make a good addition to a bass-light, entry-level, sub/sat or stereo system.